Free radicals can harm cells, be they young or old. This damage may accumulate and manifest as threats to the body’s well-being later in life. The earlier a person begins consuming a diet rich in antioxidants from whole foods and whole-food supplements, the greater the protection from free-radical damage. Benefits may show up in childhood in the form of a stronger defence system, or they may manifest themselves during adulthood as slowed onset of the effects of aging. Vita Guard delivers a broad spectrum of whole-food antioxidants to help protect cells and tissues. It’s an investment worth making to maximize your child’s chances for optimal well-being, both now and in the future. Why antioxidant supplements for children? To help provide antioxidant nutrients that protect cells. To help protect children’s delicate tissues and organs at a time when the rapid metabolic rate necessary to support tremendous growth and development is also generating free radicals. To help support immature defence systems, which in childhood are called upon to respond to some of their greatest challenges. To help protect cells from oxidative damage spurred by children’s high levels of physical activity. To help counter free radicals generated by sunlight, smog, ozone, pesticides, food additives, cigarette smoke, drugs and other substances to which children are routinely exposed. To fill nutritional gaps that are the rule rather than the exception in the diets of children, the majority of whom do not eat the 5-9 daily servings of fruits and vegetables that health authorities recommend for optimal well-being. Why GNLD's children's chewable vita guard? 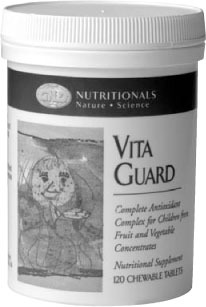 Vita Guard provides the most complete antioxidant protection available to defend children’s cells. Vita Guard features both water- and lipid-soluble antioxidants for optimal cellular protection. Flavonoids and vitamin C protect the watery portions of cells while carotenoids and the entire vitamin E family protect their lipid regions. Zinc and selenium are key mineral components of the body’s natural antioxidant enzyme systems. Features the flavonoid family of water-soluble antioxidants. Vita Guard is the only children’s chewable tablet to deliver a broad spectrum of flavonoids from naturally occurring whole foods: cranberries, green tea, mixed berries, lemons and oranges. Features the carotenoid family of lipid-soluble antioxidants. Vita Guard is the only children’s chewable tablet to deliver broad-spectrum carotenoids from naturally occurring whole foods: carrots, apricots, peaches, strawberries and tomatoes. - Vitamin A from beta carotene and other whole food carotenoids. - Entire vitamin E family of mixed tocopherols and tocotrienols. - Vitamin C, plus flavonoids to support optimal utilization of the vitamin C.
Contains Selenium to work synergistically with vitamin E.
Contains Zinc, important for the defence system, appetite and growth. Naturally occurring sweeteners - fructose and fruit- juice concentrates (grape, orange, apple). Naturally occurring fruit essence flavouring with no artificial colours or preservatives. Chewable! Your children can begin to receive antioxidant protection as soon as they are old enough to chew a tablet.